Oh it looks like beautiful fabric! Gorgeous fabrics, and website!I would love to win! Congratulations on the new sponsors Simone, they are truly talented and a great match with you and your blog. Anything from the gorgeous Thea & Sami would be a beautiful addition to my home...count me in please. The peacock print fabric looks beautiful!! Just gorgeous. I LOVE peacocks! Beautiful fabrics - I love her blog too! Great give away Simone I love Thea's fabrics especially her new range I have her Margarite fabric which I have just desided on what to make. I always seem to keep fabric for ages untill I know what to do with it hate cutting in to fab fabric with no idear (I'm a scaredy cat) hee. I would love to win. I have soe much I can do with all of this fabric! Amazingly lovely! Count me in, please! i love grey for this season! It is SO pretty. Thanks for the giveaway! LOVE this pattern. Perfect for some new beach inspired pillows! Love that fabric, and the background color. Hi, Simone!! My comments come anyway, have only to pray for the giveaway!!! Kisses, Bela. Oh it looks and sounds fabulous. I love the peacock fabric. Sent over here from Thea's blog! I love Thea & Sami's prints, and this one is no exception! Oooh Love it! Fingers crossed!!! gorgeous fabric, will be checking out their site :) cheers Simmone! I'm in love with peacocks. I'm in love with linen and I'm in love with Thea's prints!! Thanks for the giveaway. WOW!! My four year LOVES peacocks!!! Just what I am looking for!!! Wow, what a beautiful cushion that would make - count me in!! How beautiful! Count me in please, Simone. Lovely fabric I hope I win it is SOOOOO nice. I'm off to have a look around your blog, thanks. 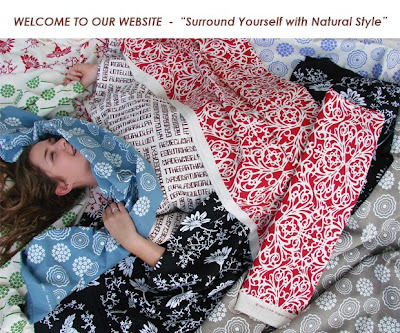 Wow, all those fabrics are stunning, so vibrant and such fantastic patterns! Beautiful website. Pretty fabric. Please count me in. beautiful fabric! fingers are crossed. 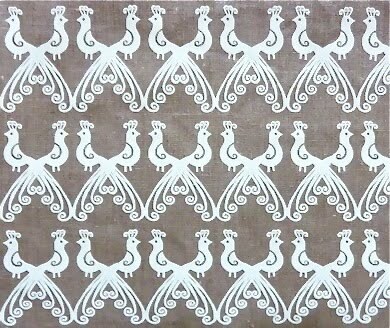 That row of little peacocks on mud flax linen, echo the Mexican folk art of my memories. Ohh I really like that fabric! Oh this fabric would be absolutely perfect for re-covering some foot stools I recently picked up. Crossing fingers and toes. Wow! I love the peacock repeat design. Lovley beachy colour and it looks fabulous upside down too! I'd love to win it too. Thank you. Beautifully natural!! Stunning work, keep creating! Totally gorgeous fabric, love it, do count me in! AmAzing what FABRIC can do for a GIRL !! Thanks for introducing Thea and Sami to me. what stunning designs. Would love to be considered for the giveaway. Thanks. I love Thea and Sami fabrics ! What a beautiful print! I love Thea's work. hola simonne..they are great!! l love the natural linen!!! !l was visiting their blog...really beautifull fabrics and things!of courseeeee l would love at least 10 cms of that linen!!!! !ja ja! !l am happy of you beacause your sponsors are beautifull!!!!! !muchos besosssss and have a beautifull day!!!!! Love,love,love the peacock print.I think it is just gorgeous in the white frame.Thea is so talented. How fun to be layered in beautiful fabrics. Great find and addition to your shop. I love Thea's fabrics ... thanks for the opportunity. This fabric will go amazingly in the red, black and white quilt i'm making. I am so obsessed with fabric right now. This is so pretty! Oh, that's such a lovely pattern! Just perfect! I love this fabric! I would love to use it in my bedroom. The repeating peacock print is just divine. Thank you for the opportunity. Lovely cloth - very chique design. Thanks for offering this giveaway. Prosit! Beautiful Fabric! Thanks for the giveaway!! Delightful ... I love it! These fabrics are gorgeous, I'm keeping my fingers crossed! Thanks Simone for another great giveaway! Congratulations on your new sponsor. I will be glad to be included in the list.....I hope to win!!! I already had a look at Thea & Sami-blog and I only can say: beautiful fabrics! I would love to participate in this lovely give-away. Thank you! ...Beautiful Fabric.......have a great trip with your friends! The peacock print is devine! So neutral and retro! I love it. What fabulous fabric. The colours and patterns are divine!! beautiful, i love it. It just so happens peacocks are my favorite. i love the scrap packs of fabrics, great for small projects!! i love the scrap packs of fabric, great for small projects! these fabric are beautiful.. thanks for sharing! i love the scrap fabric packs.. perfect for small projects. wow I hope I'm not too late, beautiful fabrics! i love thea and i love her fabrics! I love the fabric, so colorful. Thanks for the chance to win. Faboulous. I love that fabric print. So...finger crossed. love peacocks and love the fabric! Thanks for the giveaway! Very nice- thank you so much for the chance! gorgeous! thanks for the opportunity! I would love to make something gorgeous from tis fabric.....PIck ME!!! !